TAKE ACTION: Don’t let NAFTA’s ongoing renegotiation result in a TPP 2.0. 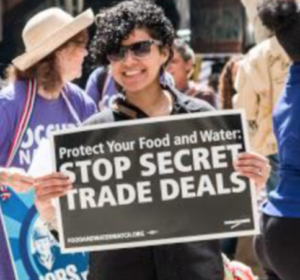 Please email the U.S. Trade Representative and Congress to end the rigged negotiation process that puts corporations over working families and the planet. Are you on Twitter? If so, please click here to send a Tweet calling for transparency in the ongoing NAFTA negotiations. If big corporations are allowed to dictate the terms of NAFTA’s replacement, the pact could become even worse for the economy, the environment and public health in the United States, Mexico and Canada. At this moment, the public is being shut out of the North American Free Trade Agreement (NAFTA) negotiations, while hundreds of corporate lobbyists have been given special “cleared advisor” status that gives them privileged access to proposed texts and to the negotiators themselves. This is the same rigged process that got us bad trade deals from NAFTA to the TPP, but it’s not too late to make NAFTA negotiations accountable — Congress must act.